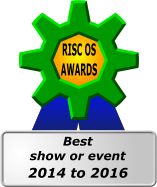 Help us to advertise the RISC OS London show, by adding these banners to your own websites. You can cut and paste the snippets of HTML to your own pages. The RISCOSitory write up is here and includes plenty of photos. The Iconbar has a short report plus notes from the theatre talks. Plus the AmigaLads did a video diary of their day at the show! Vince Hudd's epic report from the 2016 show is online at RISCOSitory. Vince Hudd's report from the 2015 show is online at RISCOSitory. RISC OS Open Ltd, Steve Revill, with Paul Fellows on "Project Arthur and the origins of RISC OS"
Read Vince Hudd's report of the 2014 show on the RISCOSitory website. Click here for pictures from the first show.